My friend Lorraine who is a fashion stylist in London sent me THE MOST AMAZING Christmas present. 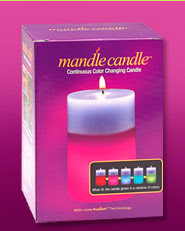 It's called a Mandle Candle. No idea, but I want one! PS. I just looked at this candle's website. "perfect for conversations" is on the selling tag. That just makes me think '?!?!'. Seriously. hummm...i can't get it...i think that candle change colours according to the humor. Damn...that reminds me to that marilyn manson song. By the way...who are u? "By the way...who are u?" there are so many answers i could give this augusto person for you amy, but i will limit it to four. 3. who are U? amy's a make-up artist to the stars,reckinize . 4. i do NOT think "that candle change colours according to the humor" any more than i think that sentence makes any sense.